Yesterday I got my normal new listing email telling me that there were 12 new home listings in Cache County Utah on Sunday. That is a ton of listings for Cache County standards, especially for a Sunday. Well it turns out that 11 of these homes for sale were brand new construction homes, and all of them were priced above $399,000, with one being priced at $1.8 million! These are high end homes in Cache Valley Utah. These are homes in a price range that has a very slim chance of selling right now. After a more detailed review, the building of these “new construction” homes hasn’t even begun yet. These aren’t actually homes for sale, but are simply lots with a made up price and possible floor plan of a home that might possibly be something similar to the home that is actually built in the lot location. From a marketing standpoint, this is actually a pretty good idea. Harness the power of the MLS and IDX feeds with fake homes for sale to get potential buyers to ask about a particular builder, and think about building. From a statistics and market condition standpoint, this is downright dishonest and misleading. Having a dozen phantom high end “North Logan Homes for Sale” has a significant impact on the average price of homes for sale, and on the months of real estate inventory our market appears to have. At the beginning of the month when I ran my monthly home sales statistics, there were 794 homes for sale in Cache County with an average list price at $237,173. Right now there are 820 listings with and average list price of $246,118. So Cache County home prices went up $9,000 in the last 20 days! This is the first time in 15 months that home prices have gone up. This means our real estate market downturn is finally turning around right? No. Not really, there just happen to be a dozen fake listings that make the average list price of Cache Valley homes look higher than it really is. 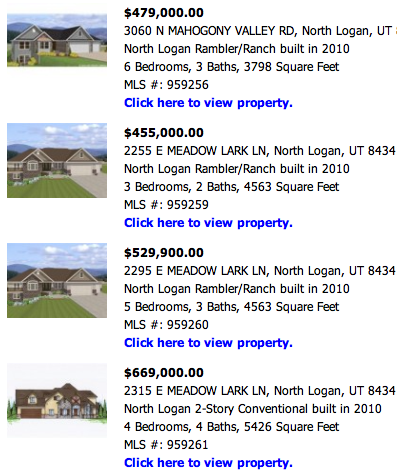 via Real Estate Blog – Phantom Home Listings in North Logan.